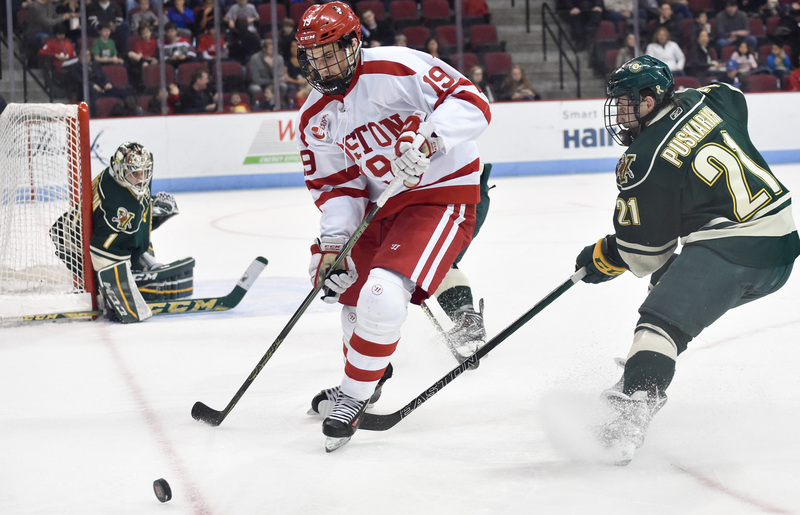 One of the Boston University men’s hockey team’s most experienced forwards has left the program ahead of the 2016-17 season. Robbie Baillargeon has transferred to Arizona State University as a graduate student. The Sun Devils, who captured the the 2014 ACHA national title, are entering their first season of Division I competition. Baillargeon began his college hockey career at Agganis Arena in 2013, bursting onto the scene as a bright spot from a 10-21-4 season. The Enfield, Connecticut native’s 27 points were best on the team, while his 10 goals and 17 assists were both tied for the team lead. Also the Ottawa Senators’ fifth round selection in the 2012 NHL Entry Draft, Baillargeon’s torrid scoring pace slowed down come his sophomore campaign. His three goals and 13 assists were helpful contributions en route to BU capturing a Beanpot Trophy, Hockey East regular season title and Hockey East Tournament championship. Baillargeon, who starred with the Omaha Lancers of the USHL before joining the Terriers, also battled mononucleosis in 2014-15. Come Baillargeon’s junior year, his performances became inconsistent, as head coach David Quinn tossed various linemates his way. The future Sun Devil finished with six goals and six assists, with a trio of three-game point streaks popping up throughout the 2015-16 season. After BU was bounced from the 2016 NCAA Tournament by the University of Denver on March 26, speculation arose that Baillargeon would finish his college career beyond Commonwealth Avenue. He wasn’t named a captain of any sort for his senior season, and now he’ll take his talents to The Grand Canyon State’s up-and-coming program. DURHAM, N.H. — Close, but not close enough. Better, but not good enough. The Boston University men’s hockey team came close to a win against the University of New Hampshire Friday night and, were it not for several highlight-reel saves from Wildcats goaltender Casey DeSmith against an improved first line, the Terriers very well could have left Whittemore Center with a victory. Instead, BU (8-17-4, 3-9-3 Hockey East) lost 4-3, its six consecutive game without a win. BU outshot UNH (17-15-1, 9-8 Hockey East) 40-27, including 13 shots in the final frame. It was the first time the team has outshot an opponent since a 4-1 win over Bentley University on Dec. 13, and much of that recent improvement can be attributed to the play of the first line. That line, consisting of junior Evan Rodrigues, freshman Robbie Baillargeon and sophomore Danny O’Regan was doing nearly everything right on Friday. Those three combined for 15 of BU’s 40 shots, and each scored a goal against UNH. They are responsible for five of the six Terrier goals in the past two games. Rodrigues gave the Terriers life near the end of the first period, scoring a power-play goal on a rebound with 7.7 seconds left in the frame. He also assisted on an O’Regan goal at the 8:53 mark of the second period. It was the second consecutive multipoint game for Rodrigues, as he notched a goal and an assist against Harvard University in Monday night’s 6-2 loss. BU coach David Quinn attributed the improved play of the first line in part to Rodrigues’ health. Rodrigues dealt with a knee injury earlier in the year but has started to recover. O’Regan’s goal came midway through the second period on a deke around DeSmith, bringing the Terriers within 3-2. The Terriers certainly felt that adrenaline late, and were within 4-3 after a Baillargeon goal midway through the third frame. O’Regan could have tied the score up and gotten his 10th goal of the season with just minutes left in the game, but an unbelievable save from DeSmith preserved the score at 4-3. O’Regan lay on the ice in disbelief for several seconds after the save. Quinn said that the first line is starting to come together due in part to the players’ increased focus on simplicity. O’Regan also noted that the line has been playing in a much improved, simpler fashion as of late. But Quinn said ultimately, while the Terriers and the first line in particular have shown great improvement over the past few weeks, it is frustrating not to escape with a win. ANN ARBOR, Mich. — The No. 13/14 Boston University men’s hockey team fell at the hands of No. 4 University of Michigan, 2-1, at Yost Ice Arena Friday night. Here is a look at some of the pluses and minuses for the Terriers in their second loss of the season. BU has made a habit of spending time in the penalty box this season, a place that they found themselves a lot again Friday night at Michigan. It started in the first period, when the Terriers took three penalties in the first 12 minutes of the game and allowed nine power play shots. One of the penalties was a too many men on the ice penalty, which is the second one BU has taken in as many games. Besides a penalty shot induced by a hook from sophomore forward Mike Moran, the other four minor penalties were taken by four different defensemen. Senior captain Patrick MacGregor, who was benched for the first period because of the penalties he had taken in recent games, and freshman Dalton MacAfee were the only two defensemen that did not take a penalty in the game. One reason the penalties were so necessary was because Michigan was passing the puck so well and had chances to get open looks at sophomore goaltender Matt O’Connor. Three of the four penalties were tripping penalties while the other was an interference call, all of which were to stop the fast-paced Michigan offense from getting past them. Even with the Terriers struggling to stay out of the box Friday night, penalty trouble has not been as much of a problem for BU as it has been for several other teams in Hockey East. BU is eighth in the league with 12 penalty minutes per game, 10.6 minutes per game behind league leader Northeastern University (22.6). Quinn has stressed all season the importance of his team making the smart, five-foot pass instead of a long stretch pass through the neutral zone looking for a big play. However, the Terriers found themselves looking for longer passes again Friday night, and it fell right into the hands of the Wolverines defense that was waiting for them. Several Terriers tried to squeeze longer passes through a suffocating Michigan defense, in turn creating offensive opportunities for the opponent instead of their own team. Quinn also pointed out BU’s struggles with passing on the initial rush as a reason his team did not possess the puck for much of the game. “Coming down on a 2-on-2 or a 3-on-3 in tight areas with high-risk plays and boom, they turn it over and they go the other way,” Quinn said. “Against this team that is the last way you want to play. You can’t play that way. We did it all night long. … That’s the frustrating part. Freshman winger Robbie Baillargeon scored his first collegiate goal last Saturday against Wisconsin, and now he is on a bit of a streak. With less than two minutes remaining in the first period — a period in which the Terriers were outshot 14-6 — Baillargeon rifled a wrist shot over Michigan goalie Zach Nagelvoort’s shoulder while falling backward. Quinn showed his confidence in Baillargeon’s abilities early when he put him on the first line with sophomore center Danny O’Regan and junior winger Evan Rodrigues, but decided a move to a line with sophomore winger Matt Lane and junior center Cason Hohmann would suit his skills better. Since joining that second line, Baillargeon has two goals and two assists and has been arguably the Terriers’ best forward. The top Terrier on the night by a long shot was O’Connor, who made 42 saves in a losing effort. O’Connor was stellar on the penalty kill and 5-on-5, and made several key saves that required him to move post to post to kick the puck aside. For more on O’Connor’s night, click here.